This chapter explores tropes of blackface from previous chapters as they appear in three of Shakespeare’s plays, Antony and Cleopatra (1607), The Tempest (1610–11), and, above all, Othello (ca. 1604–05). Each stages representations of black Strangers that bear affinities with moral allegories of protagonists named Youth or Wit tempted by Vices that draw upon Proverbs 1–9. 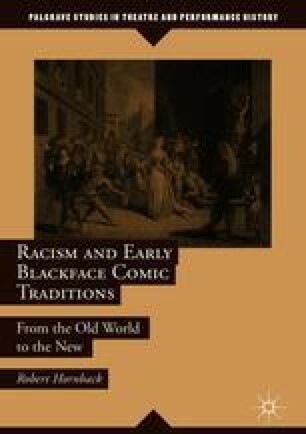 Shakespeare’s plays include many of the tropes discussed in previous chapters that were common to the English morality genre and to Spanish Golden Age drama, including blackface as an emblem of folly and black misspeaking as a moral emblem. They do so, however, in ways that complicate audience responses to racial difference. Here, attempts to read these plays as conventional metaphysical allegories of race are challenged, frustrated, or even foiled. Mowat, Barbara Paul Werstine, Michael Poston, Rebecca Niles, eds. Shakespeare’s Plays, Sonnets and Poems, Folger Digital Texts. Washington: Folger Shakespeare Library. Accessed December 31, 2016. www.folgerdigitaltexts.org.